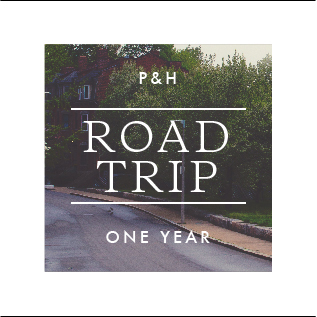 A handful of months ago when we were planning our year-long road trip, we made a list of all of the National Parks and places we wanted to see and calculated the driving distances between each. Four to six hours is where we like to cap our driving time at any one go to help prevent burn out, and so for any destination that required driving more than this length of time, we did our best to pick a spot or two along the general route to crash for the night. Cashton, Wisconsin was one of those places. Cashton is five hours from Chicago and only came on our radar because there was a pet-friendly AirBnB listing with solid reviews. The carriage house is on a two hundred and fifty acre homestead and horse farm and we thought that could be fun too. What we didn’t expect was to meet two of the most welcoming, warm, and interesting hosts, Carol and Ron, who have twenty-three kids (eighteen of whom they adopted from all over the world) and thirty grandkids! They also have the friendliest bunnies, a massive St. Bernard dog, chatty ducks, and lots of beautiful horses. And Cashton? It has the most dazzling sunsets we’ve ever seen. The first night the sky turned such a bright gradient of orange and pink, I actually stopped what I was doing inside the house three separate times to go outside and just stare at it in awe. Another very pleasant surprise while we were there was finding a vegan-friendly co-op the next town over that put our Whole Foods in Boston to shame. I stumbled upon so many new-to-me and local brands for everything from coconut milk ice cream to kombucha to gluten-free bread. It was paradise. Given the unexpected abundance of food options and the cozy carriage house kitchen, complete with a stove and an oven (amenities I no longer take for granted), I spent a day leisurely working on a new banana bread recipe, then turning it into French toast, with breaks in between for strolling through grassy fields and saying hello to cows and horses grazing along the way. Life felt like one of Gwyneth Paltrow’s glow-y cookbook photos for a moment there and I soaked in every sunny second. This banana bread is adapted from my secret ingredient banana bread of almost four years ago, shortly after I first started Pickles & Honey. 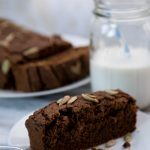 I wanted a vegan version that would be low-glycemic and naturally sweetened, lower in oil than traditional banana breads, and gluten-free but not dry or crumbly. 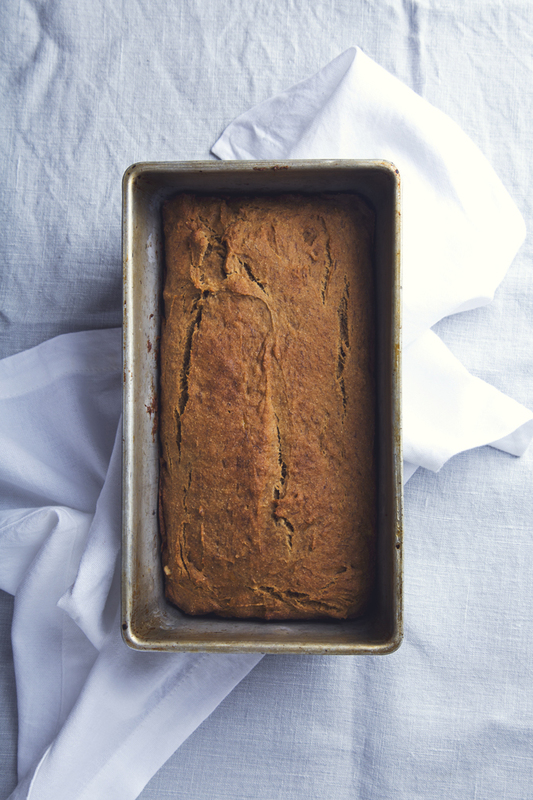 This is that banana bread, and it’s made even more delicious in French toast form using chickpea flour for a subtle egg-y flavor. Top it with coconut whipped cream, walnuts, berries, and a pour of real maple syrup for a breakfast or brunch that feels decadent and fancy while still being effortlessly simple to make. 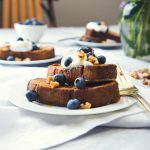 Easy gluten-free and vegan banana bread in French toast form! Perfect for a breakfast or brunch that feels decadent and fancy while still being effortlessly simple to make. Pre-heat the oven to 350 degrees F. Lightly grease a 9x5 inch loaf pan. Make the banana bread: In a large bowl, mash the bananas until very few lumps remain. Add the coconut oil, coconut sugar, and applesauce. Whisk to combine. Sift in the gluten-free flour blend, xanthan gum, baking soda, cinnamon, and salt. Mix with a wooden spoon until just combined (the batter will be very thick). Transfer the batter to the prepared loaf pan and bake for 25-30 minutes, or until a knife inserted in the center comes out clean. Allow to cool completely, then cut into 1-inch thick slices. Make the French toast: In a large shallow bowl, whisk together the non-dairy milk, chickpea flour, arrowroot, vanilla, and salt. Heat a large non-stick frying pan over medium heat, then brush it with coconut oil. 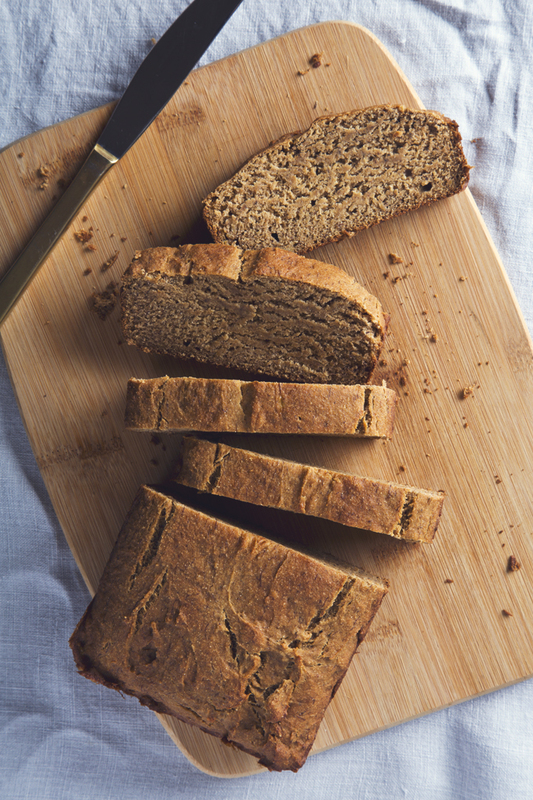 Take one slice of banana bread and soak it in the milk mixture for about 15 seconds on each side. Place the soaked bread on the pan and cook until golden, 3 to 4 minutes on each side. Repeat with the remaining banana bread slices, greasing the pan before each. 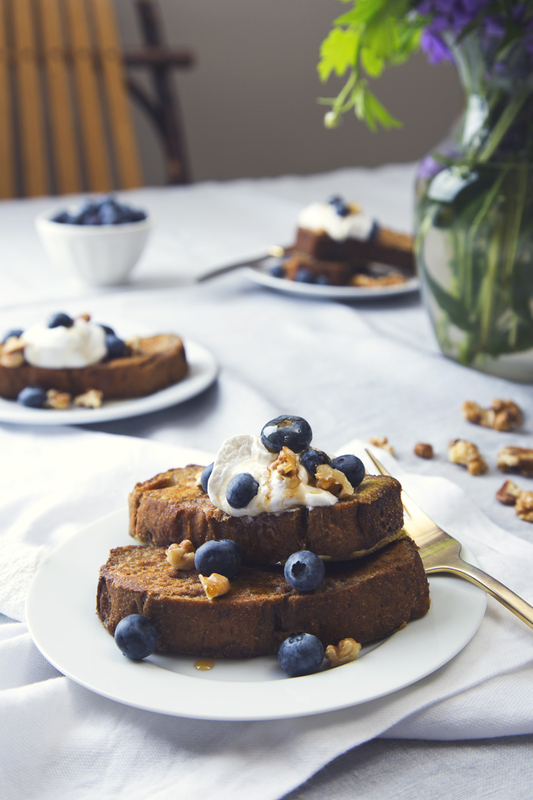 Serve warm, topped with maple syrup, coconut whipped cream, walnuts and fresh berries. Enjoy! banana bread is one of my favorite things to bake..and you have turned into french toast, how delicious. i was hoping to see pictures from the farm..
What an awesome idea!.. I don’t particularly like French Toast (with regular GF bread), so this may change my opinion about it!.. Amazing photography BTW! Thanks for the compliment on the photography! 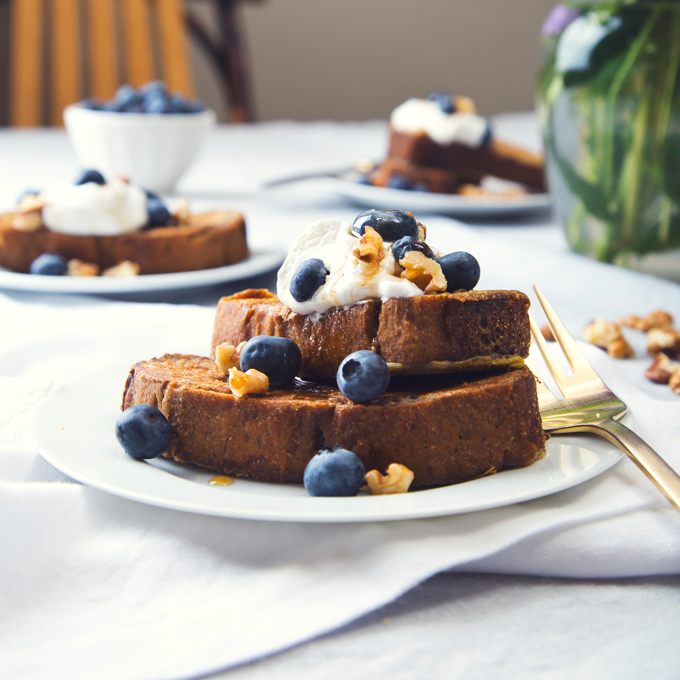 You might try banana bread French toast (assuming you like banana bread!). It could be a game-changer. This looks beautiful and delicious. 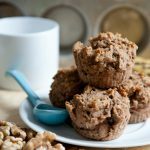 I’m the only vegan in my family of four, and am always on the lookout for recipes that my husband and kids will enjoy as well. This one definitely fits the bill. Can’t wait to try it. That’s awesome, Kim! If you give the recipe a try, let me know how your family likes it! Girl – I can FEEL how transformative this trip has been for you already! I’m extra hormonal today (missed a pill so had to double up and it always makes me all sorts of nauseous and FEELS-y) so this post made me cry. Yes I’m crying over banana bread. But not really the bread, the small but profound changes that are shining through. I was rereading the astrological report for 2015 this am after I did my desire mapping (if that makes no sense: I read some astrology after journaling) and it stuck out to me that this is a year of 8: where everything we’ve done in the past 8 years comes together to set us up for the next 9. 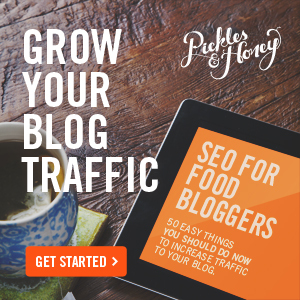 I’m feeling that deeply in my own life but also deeply in your blog. 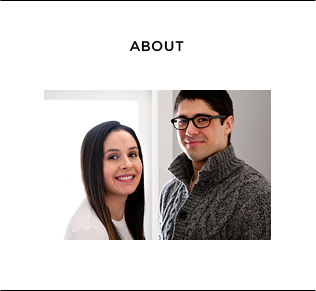 SO happy + grateful to follow along on this journey with you! You leave the most insightful and interesting comments, Kait. <3 Cashton caught us by surprise in the best possible way. We were listening to a podcast a few days earlier about the blue zones and Carol and Ron are a perfect example: super active lifestyles (with exercise built into their day-to-day farm work) and a big, supportive community surrounding them. They have family there constantly (I mean, 23 kids?! ), they regularly host big church events...it was really nice to see that sort of lifestyle done well. This toast looks simply delicious! I love your food photography. Keep up the good work! Thank you so much, Margarita! 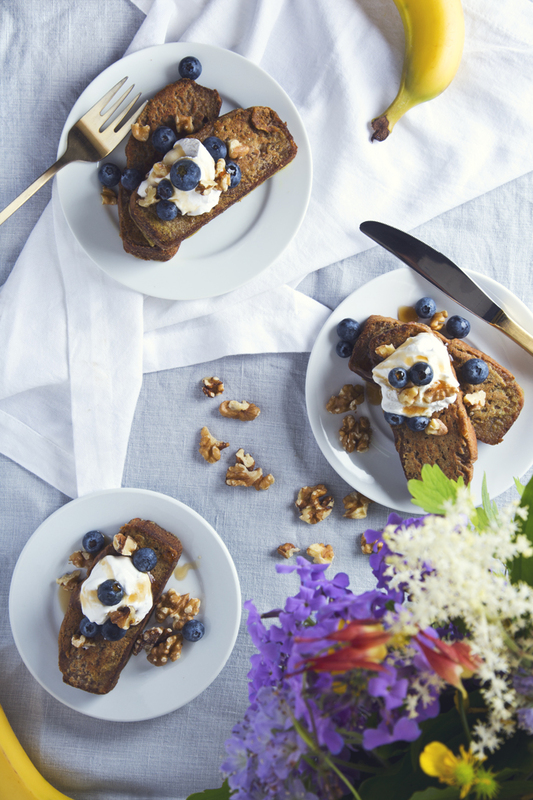 Banana bread and french toast in one? This sounds like heaven. 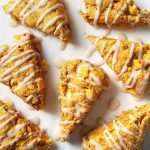 I have never cooked with Chickpea flour, but I definitely will now so I can try out this recipe. We love that you are traveling and cooking, true dedication and so interesting to follow. 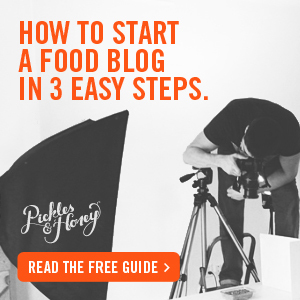 Would you be interested in working with Chicory and becoming a recipe partner? This bread looks amazing! I never thought to use a mixture of flour with chickpea flour.